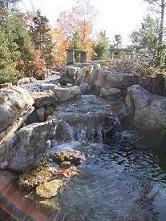 Construction, arrengement and maintenance for Japanese style garden such as Rock garden and Zen garden. Construction and maintenance of Japanes style exterior such as Waterfall, Pond, Bamboo fence, Deck, Gate and etc. Construction of Japanese style interiors such as Shoji screen, round shaped window, Tokonoma, and etc. Garden maintenance work is available ONLY for Japanese style garden. Please contact us by email or phone. We don't carry any showroom. To create tranquil and intellectual atmosphere in a living area for relaxation and entertainment. Trees: Black pine, Japanese maple, bamboo, cherry, and etc. Ground covering: gravele, moss, and etc. Flowers are very rarely used in Japanese garden. Size and shape of stone(s). Size and quantity of plant(s). Combination of plant(s), stone(s) and rock(s). Color coordination through four seasons.